This morning, we released the information that at the invitation of President Xi Jinping, President of the Republic of Zimbabwe Emmerson Mnangagwa will pay a state visit to China from April 2 to 6. During the visit, President Xi Jinping will hold a welcoming ceremony and welcoming banquet for President Mnangagwa. The two heads of state will hold talks and jointly attend the signing ceremony of cooperation documents. Premier Li Keqiang and Chairman of the National People's Congress Standing Committee Li Zhanshu will meet with President Mnangagwa on separate occasions. Besides Beijing, President Mnangagwa will also visit Anhui and Zhejiang. At the invitation of the Chinese government, Her Royal Highness Princess Maha Chakri Sirindhorn of the Kingdom of Thailand will pay a visit to China from April 3 to 10. During the visit, the Chinese leaders will meet with Princess Sirindhorn and exchange views with Her Royal Highness on China-Thailand relations and issues of mutual interest. In addition to Beijing, Princess Sirindhorn will also travel to Guizhou and Sichuan. Q: According to Wall Street Journal, China and the US have quietly started negotiating to avoid a trade war. The US has set out specific requests which include a reduction of Chinese tariffs on US automobiles, more Chinese purchases of US semiconductors and greater access to the Chinese market by American financial enterprises. What's your reaction to this? First, China always stands for and stays committed to properly resolving differences and frictions in the field of trade through negotiation. The door for negotiation always remains open. Having said that, I must stress that negotiation is by no means an occasion for one party to make requests in an arrogant and condescending way. Instead, the two sides need to engage in negotiation in a constructive way in the spirit of mutual respect and treating each other as equals, so as to seek a win-win solution that serves the interests of both sides. Second, China's enormous achievements over the past four decades are accomplished through reform and opening up, and we will further deepen reform and opening up. China's opening up is an independent one, which will be advanced in accordance with the goals, path and pace set by us in an orderly manner. The report of the 19th CPC National Congress made it very clear that we will make new ground in pursuing opening up on all fronts. We will adopt policies to promote high-standard liberalization and facilitation of trade and investment, significantly ease market access, further open the service sector, and protect the legitimate rights and interests of foreign investors. 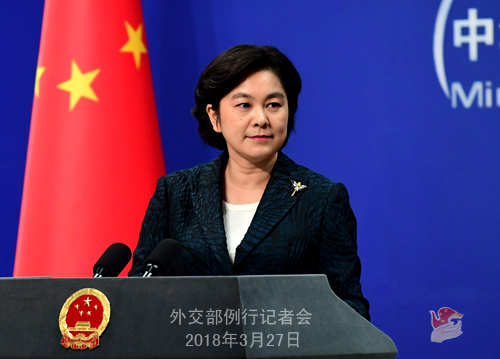 The Report on the Work of the Government adopted at the first session of the 13th NPC lately also mentioned that China will expand the scope and level of opening up, improve the layout, mechanism and institution of opening up and promote high-quality development through high-standard opening up. We will also better align with international trading rules and build world-class business environment. In a word, we are trying to ensure this market with a population of 1.3 billion is one that offers a level playing field to Chinese and foreign enterprises and enterprises under all forms of ownership. Needless to say, opening up should be two-way. We hope the US and other countries will provide fair and non-discriminatory business environment for Chinese and foreign enterprises' normal investment and commercial activities. Q: Many in the US are worried that Chinese companies and government are using trans-border investment to acquire sensitive technologies, weakening relevant US industries and undermining its national security. What's your comment? A: It is true that the US has been trying to make an issue of China-US trade ties under the pretext of "national security" recently, such as the imposition of tariffs on Chinese steel and aluminum. I don't know whether you are aware that Chinese steel only accounts for less than three percent of the total US steel imports. It's hard to understand why such a low ratio of steel imports from China could pose a threat to America's national security? One example could serve for the rest, and many actions the US has taken and plans to take under the excuse of national security fall short of legitimacy and lawfulness. This reminds me of the US threatening to slap steep tariffs on many industries in relation to the "Made in China 2025" initiative, an attempt apparently with ulterior motives. Regarding such issues, officials from China's commercial authorities have repeatedly stated China's position. I would also like to draw your attention to the remarks Premier Li Keqiang made yesterday when meeting with foreign representatives who attended the annual session of China Development Forum 2018. Premier Li Keqiang stressed that the "Made in China 2025" initiative is being advanced in an open environment and the Chinese and foreign enterprises will be treated equally. We will not force foreign companies to transfer technologies, and will make greater effort to protect intellectual property rights and crack down on infringement behaviors. We welcome more competitive and outstanding international companies to China for cooperation so as to create and share more development opportunities. 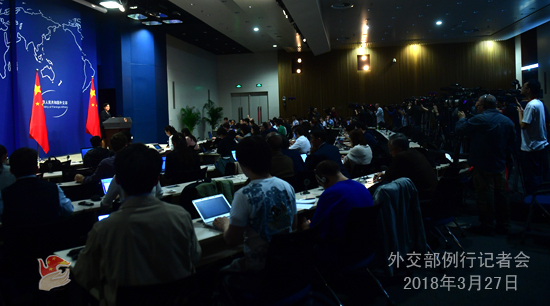 In addition, at the same forum yesterday, Vice Foreign Minister Zheng Zeguang also delivered a speech. He pointed out that it's only natural for China and the US to have some differences, but that does not mean that one could wantonly put the blame on the other and make fundamental mistake in strategic judgment, which will hurt itself and others and throw the world into chaos. Instead, we should adopt an objective and rational attitude and try to adapt to each other by putting ourselves in other's shoes. We hope the US will work with China to create a fair, non-discriminatory and sound business environment for the normal trade and investment of both Chinese and American companies. Q: How does China view the current China-DPRK relations? What are China's expectations for improving its relations with the DPRK as the situation on the Korean Peninsula is still fluid? A: As close neighbors, China and the DPRK enjoy traditional friendship and maintain normal exchanges. China is willing to make concerted efforts with the DPRK to stay committed to developing our good-neighborly and friendly relations. Q: The United States and over 20 European countries announced the expelling of almost 100 Russia diplomats in their countries in response to the poisoning of former Russian spy Sergei Skripal and his daughter. What is your comment on this? A: We are closely following the development of the current situation. 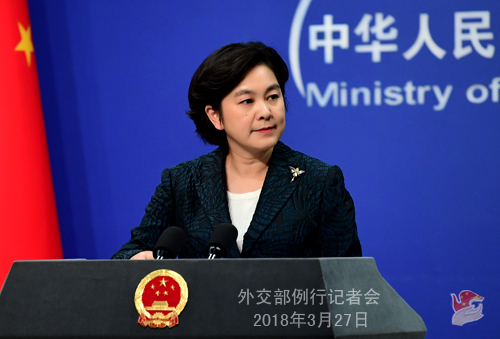 China is firmly opposed to any use of chemical weapons. We believe that the "Skripal incident" should be properly resolved through the dialogue between the UK and Russia based on getting the facts straight. The relevant countries should earnestly abide by the international law and the basic norms governing international relations and avoid taking any step that would escalate the confrontation. Currently, the international community is confronted with multiple challenges. Against this backdrop, all countries should discard the Cold-War mentality, refrain from confrontation, make concerted efforts to uphold world peace, stability and tranquility and jointly stay committed to fostering a new type of international relations featuring mutual respect, fairness, justice and mutually beneficial cooperation. Q: It is reported that Peru's new President Martin Vizcarra took the oath of office on March 23. What is your comment? A: Peru is an important country in Latin America and a comprehensive strategic partner for China. China congratulates President Martin Vizcarra on assuming office. We hope and believe that Peru can maintain national stability and economic and social development. Recent years have witnessed the considerable development of China-Peru relations and the ever deepening of bilateral pragmatic cooperation. China is willing to join hands with Peru to constantly step up cooperation in various areas and promote the sustained and steady development of our bilateral ties. Q: According to reports, the CIA and FBI have repeatedly accused China of threatening and spying on overseas Chinese. What is your comment? A: Recently we have taken many questions about all sorts of remarks made by certain people from the United States. Regarding those groundless accusations, we really do not want to waste time responding to them one by one. We hope that relevant people can abandon the Cold-War mentality and zero-sum game mindset and create favorable conditions for the sound development of our relations with an open and inclusive attitude. Q: According to reports, on the evening of October 25 local time, Yemen's Houthi forces launched seven ballistic missiles to Riyadh, the capital of Saudi Arabia, Jazan and other places, which killed one person and injured two others. All the three people are Egyptians. What is your comment? A: China consistently opposes and condemns the violent acts targeting civilians. We hope that all relevant parties to the Yemen issue can launch political dialogue at an early date and find an inclusive solution.